More fun! I love this header and just needed to design another piece for it! 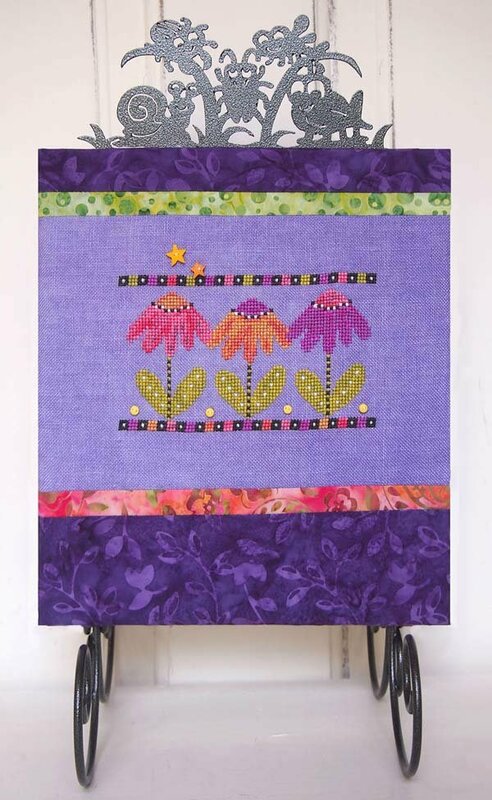 Presenting Katydids & Coneflowers stitched over two on Weeks Dye Works 30 count Peoria Purple linen (32 count works for this as well!) Stitched with two strands of Weeks floss in Autumn Leaves, Berry Splash, Dahlia, Onyx, Pepperoncini and Whitewash. If you also stitched Halloween Happy, you can just pick up a skein of Dahlia and you'll have plenty to stitch this one as well. SamSarah polymer clay buttons are included and not available separately. Finishing instructions are included to place this on a 6" x 9" table stand (new size for me) HERE topped with a 6" Bugs Header HERE. Sadly, this design has a a problem with the floss key, but you can download the correction HERE.